DSE stands for the Digital Signage Expo, and it’s one of the largest industry events of the year. Typically held in Las Vegas, hardware, software, content, and systems vendors flock to sin city to share their latest and greatest digital signage offering. Each year, we attend DSE for new business development, vendor relations, and to discover new opportunities that help set us apart from the competition. There are many great products and solutions at DSE, yet it’s important to focus on what can enhance our core product mix. As some of the latest and greatest trends are fun to see, many are still a ways off from being mainstream or even accepted by clients. Like most digital signage, we are seeing the cost of entry dip, meaning it is becoming more affordable for clients to deploy digital signage in their business. As screen prices, hardware costs, monthly fees, and ongoing support continue to improve across the industry, we will continue to see brands introduce digital signage into their environments. With all the flashy lights and cool screens at DSE, it is important to find trends that are becoming more accepted by clients while also finding new offerings that fit into our portfolio. Our current and future clients still demand competitive price, best-in-class on-going support, and a consultative mindset that scales with the client. It’s important to continue to drive home our key competitive advantages while remain forward thinking in our digital signage offerings. With that in mind, it’s still fun to look and see what trends are coming up next. 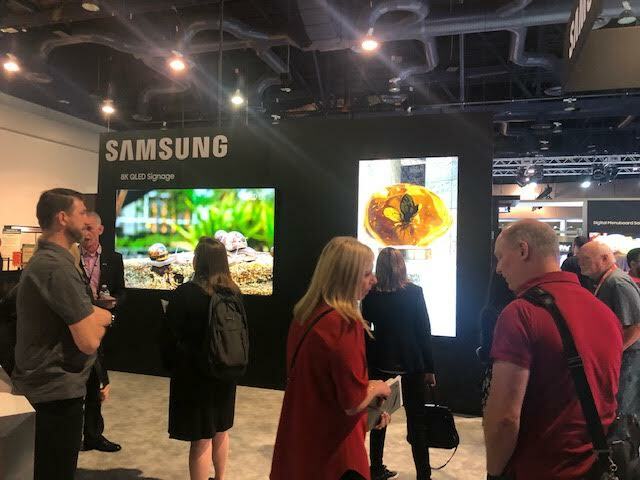 One trend that was apparent at DSE 2019 was the introduction of Samsung 8K screens. Not HD, not 4K, but 8K screens! The displays on these bad boys were intense. The level of detail seen on screen was absolutely memorizing and literally stopped me in my tracks. The 8K video content shown on screen provided amazing clarity and an impactful “wow factor.” From the bright vibrant colors of the Amazon rainforest to seeing each bolt on the international space station as if floated above Earth, the content samples displayed these 8K screens was powerful. The cost of entry for this solution is still expensive, yet, as we’ve seen with other digital signage deployments, over the years price points will decline and allow more brands to take advantage of new technology. Mood is not selling 8K screens (today), but knowing this technology exists excites us for future deployments and product offerings!